Michael Caine (I think it was) was once asked if he could live his life over again would he changed anything? His answer: I’d change nothing – except I would make sure I never watched the film ‘The Magus’. Based on the novel by John Fowles (which is a good read) everyone who made the film later revealed they didn’t have a clue about what the story was all about – and it showed! 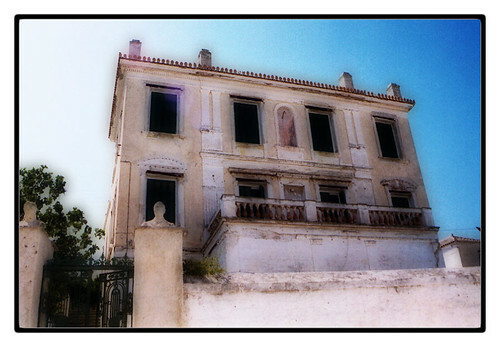 Here is a picture from Flickr of the abandoned house that inspired John Fowles in his writing. Hello- forgive the rather random and (according to the date you originally posted this item) somewhat belated response. I came across your post as I was looking for pictures related to The Magus. I have never seen this picture before, and I wonder if you would be so kind as to let me know where you came across it? I’ve added in the link to the post – I should have done this when I made the post. Thank you for drawing my attention to this! I’ve read a few different things about Bourani, and I did read online that it is still lived in. I have also seen a photo of a villa that is supposedly Bourani but I don’t think it’s the same one that you have here. Possibly it is the same house, but the back view… but it has large pillars forming arches and I know that Fowles did describe these arches in the book. P.S. That was Woody Allen’s quote! Michael Caine played the part of Nicholas in the film adaptation.